GRAND RAPIDS, Mich. (WOOD TV) — Welcome to West Michigan, where in less than 24 hours we will transition from raking leaves to shoveling snow. It has been more than six months since snowflakes fell in West Michigan. The average date for the first inch of snow in Grand Rapids is around Nov. 20. During the past two years, the first inch of snow didn’t arrive until December. 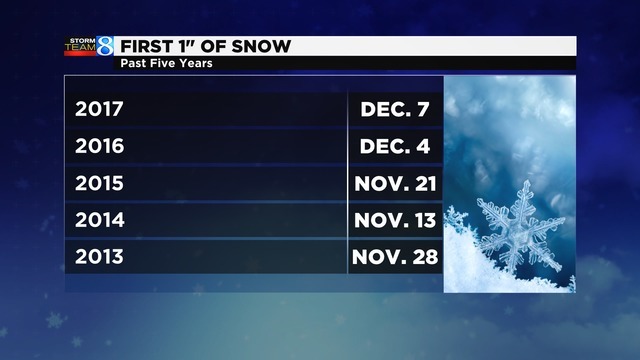 Date of first inch of snow during previous five years. Historically, the average total snowfall in November is 6.8 inches. Even though four of the past five years have been below average, 2014 made up for it with a record-setting 31 inches. 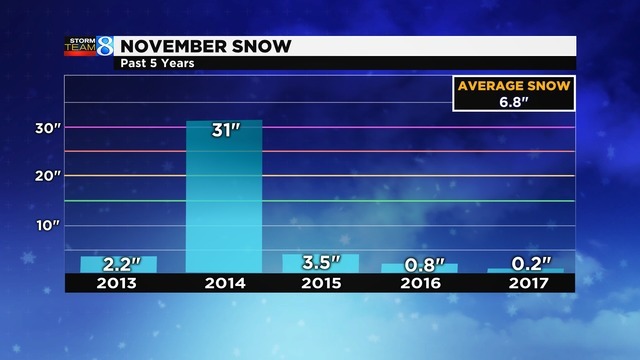 November snowfall previous five years.It appears this year West Michigan will not have to wait long for the first inch of snow. A system organizing over the Central Plains will arrive Friday with the season’s first accumulating snow.